Catastrophic nightmare (no it’s not an over reaction Megan) best sums up our last week in Turkey. And why, you ask? Is it because Megan’s snoring has become so loud that it wakes up entire hotels? Is it because I still have not been able to find Cheerios? Perhaps it’s because the daily budget has become a distant dream due to the fuel prices? No, it’s none of the above. The car, my beloved Land Rover has chosen this last week to make our lives more ‘interesting’ and our pockets a lot lighter. I suppose it had to happen really, and one problem I could have forgiven but when the count got to five that’s when steering wheels were punched, tires kicked and profanities leveled at British Engineering. 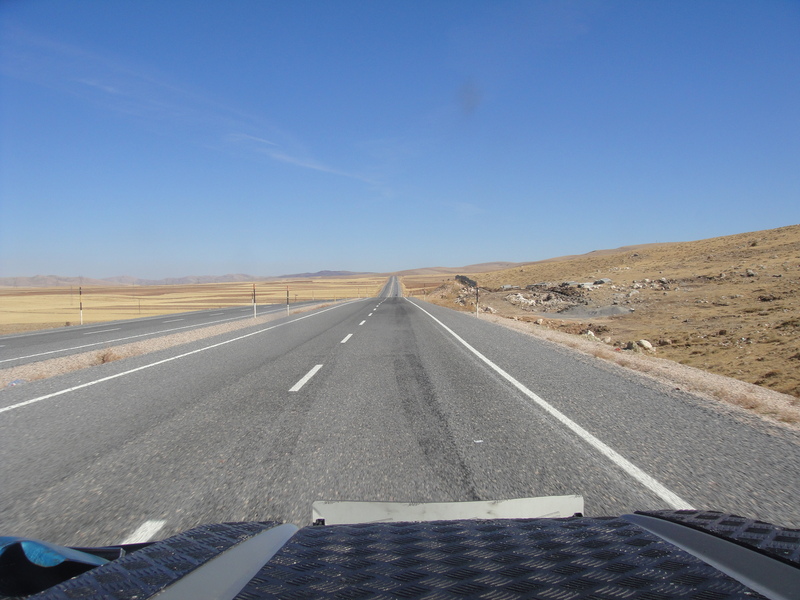 The first problem was on the drive from Goreme to Nemrut Dagi to see the famous fallen heads. Two hours out we smelt something burning and pulled over to the side of the road, only to find that the handbrake would not move. After four hours under the car (and yet another t-shirt ruined) the handbrake seemed ok and following a call back to Douglass Motors the cause seems to have been that the handbrake cable was acting as the main electrical earth of the car and hence melted. Don’t asked me to explain it any further as I really have no idea how or why this would happen. Unfortunately the only English Hamza the mechanic knew was ‘Oh my God’, a little disconcerting when he is looking at the engine, back at me, back at the car etc. 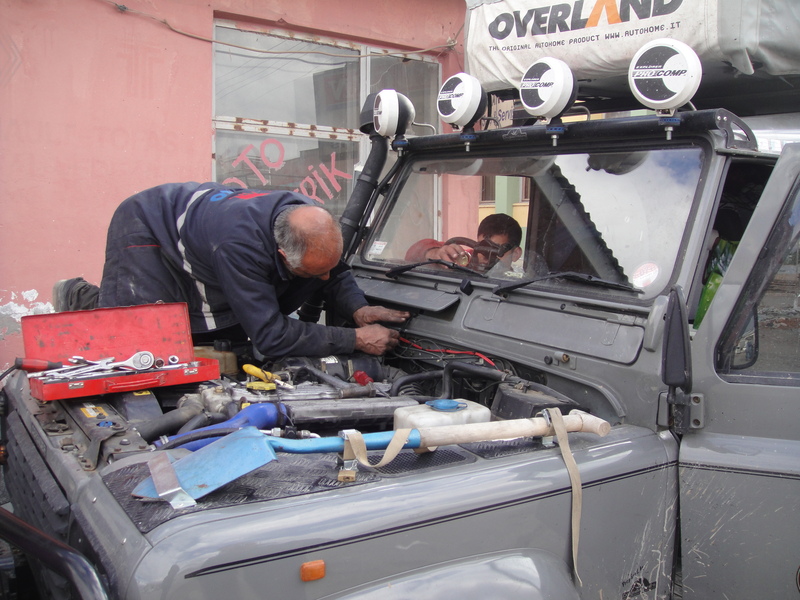 Radiator fixed but still no handbrake we spent the rest of the day wondering around Malatya and got up early the next day to drive over the mountains to Erzurum. 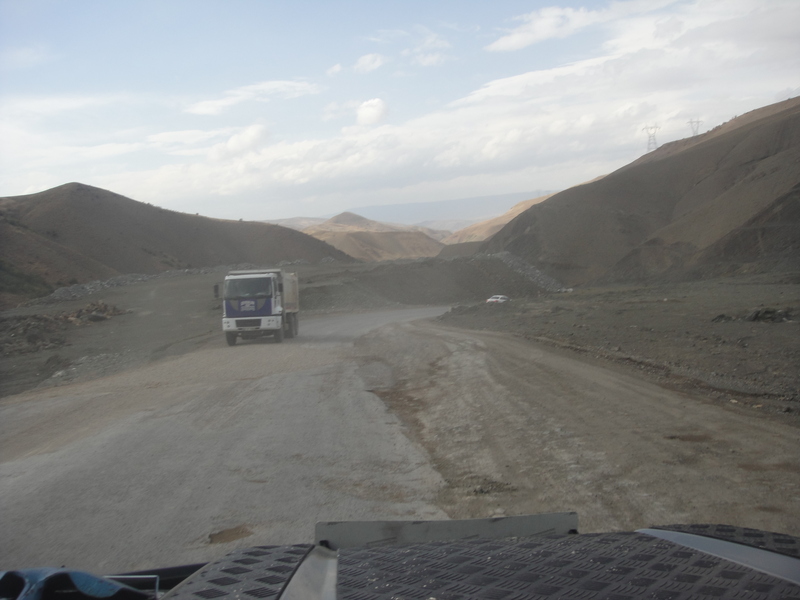 The road to Erzurum started well but as we reached the higher altitudes it turned into a deeply rutted farm track. For about an hour we plodded our way along until smoke started pouring out from under Megan’s seat! For a minute I thought the stress had driven her to the Marlborough Lights but I was quickly corrected and we pulled over quick smart. I expected to find a mass of molten plastic and copper but luckily it only turned out that one of the batteries had come loose and was touching the bottom of Megan’s seat and shorting out. 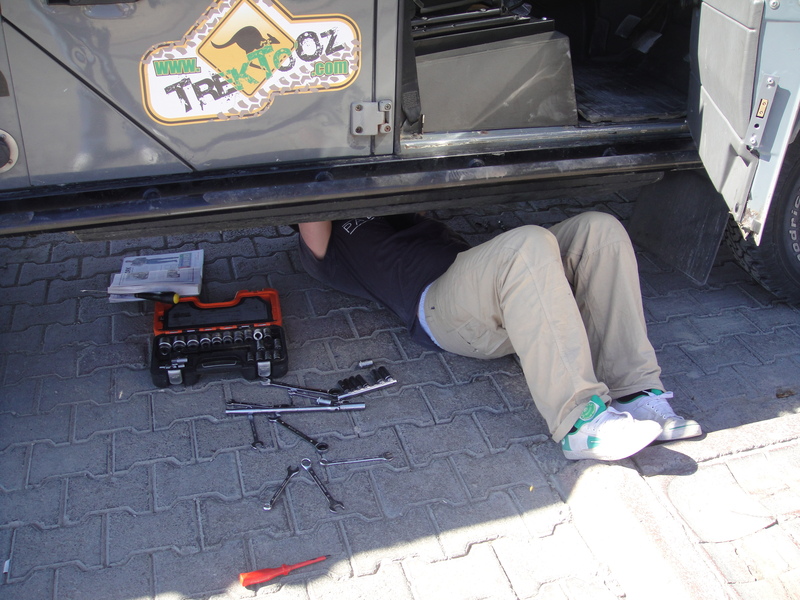 Once the battery was wrestled back into place we continued on. We soon passed through a stretch of road that I thought was wet with water but after driving through a little too quickly and coming out the other end smelling something strange it turned out that it was in fact wet tar! Are you kidding me?!? The car was covered, I mean covered top to bottom in wet, smelly tar and that stuff does not come off. Once we got to Erzurum we broke out two new sponges and the washing up liquid and scrubbed the car in a garage forecourt, much to amusement of the petrol pump attendants. Most of it came off but a lot still remains so if anyone knows of a way to remove tar from a car please let me know. I’m not going to lie to you all, I cried a little bit when I saw the state of it. 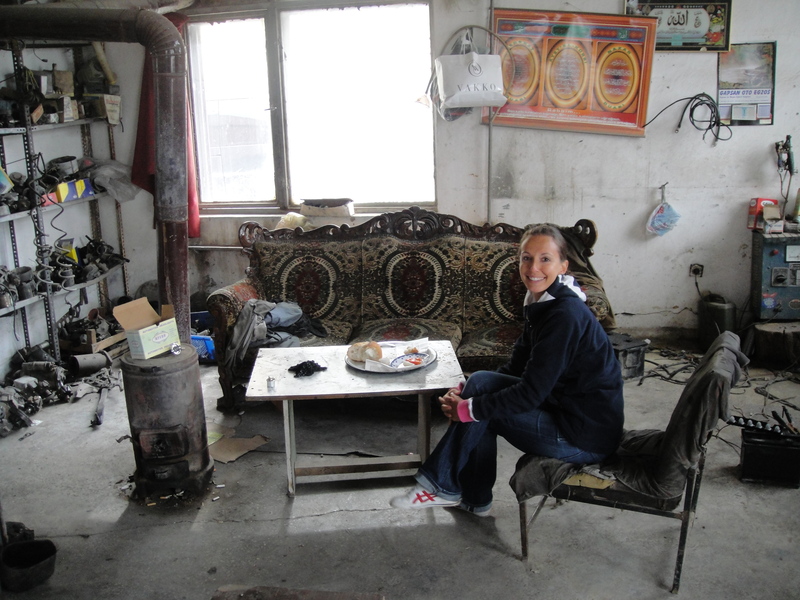 After a day in Erzurum we got up and headed to the last town in Turkey before the Iranian Border, Dogubayazit. Megan was feeling under the weather, too many kebabs, so it was a very quiet drive until I noticed the temperature gauge had gone past the red and was at max, max, max. My lengthy and surprisingly imaginative bout of swearing woke Megan up but after checking the engine it all seemed ok, so I diagnosed that the gauge was at fault. We drove the last hour very slowly, stopping often to check the engine. This was a low point for the both of us and we had one of those ‘I wish we were at home right now’ moments. We limped into Dogubayazit and after agreeing it was far too cold to camp we booked into a hostel, yes you read that right, Simon Maple checked into a hostel. Well it was £18 a night and you got what you paid for but at least it was clean. The next morning, after spending a lot of time trying to find the fault we gave in and took the car to a garage. He couldn’t fix our broken gauge but fitted a temporary one to the dashboard, which unfortunately required taking an angle grinder to the Land Rover, resulting in much wincing and sharp intakes of breath on our parts when the sparks started flying. So now as we start heading through Iran we have no hand brake, an extra temperature gauge cable tied to the dashboard and a car that smells of tar, brilliant. Now where was I, had I told you about Istanbul? Megan, have I told them about Istanbul? What?! I know you’re getting changed in the tent but just tell me if we have told our endearing fans about Istanbul? Really? Oh ok, no I don’t know where your stripy pants are. 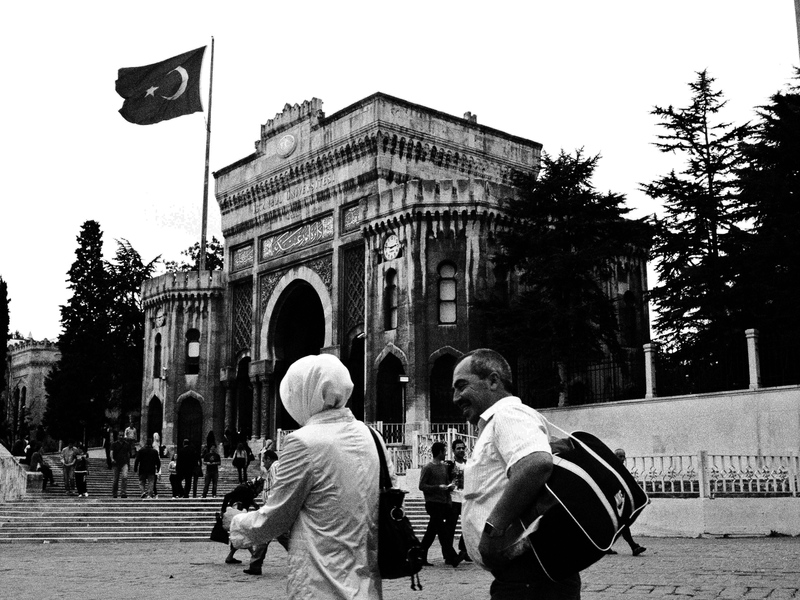 So it seems I have told you about Istanbul and a lot beside it. The 29th saw us drive towards the ‘picture post card village’ (as the Lonely Planet put it) of Olympos. The main reason to stay here is the tree houses you can stay in, unique to this part of Turkey. When I learnt about this I was very excited, as it is surely every boy’s aspiration to live in a tree house, and this would finally allow me to live out my Swiss Family Robinson fantasy… It wasn’t a tree house, it wasn’t even in a tree, a better description would have been a shed on stilts. So instead we plumped for an air conditioned hut for a couple of nights. Olympos is a bit of a backpackers’ haunt but I put my prejudices aside and really enjoyed the place. The highlight of Olympos must have been the home cooked food we got in the evening, which was included in the price and was simply delicious. Why can’t you cook this good Megan? 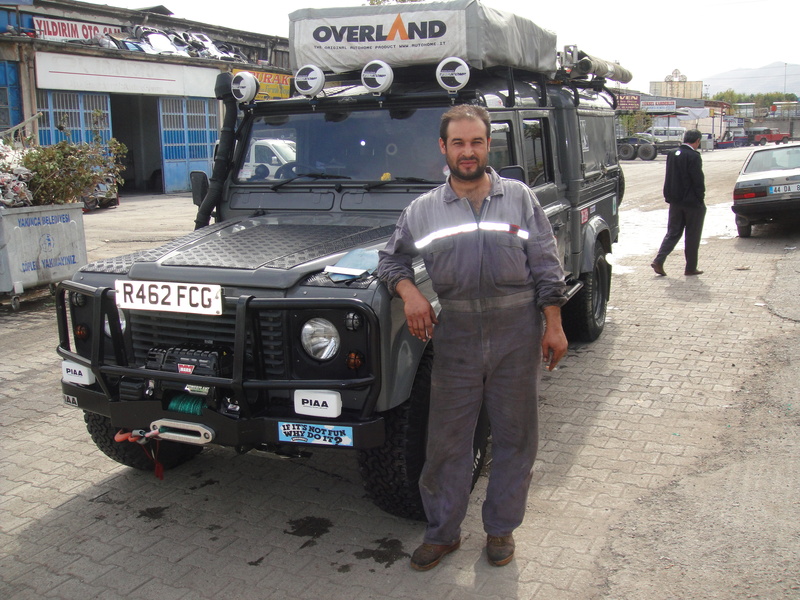 We also bumped into an overland group on their way to the Middle East. 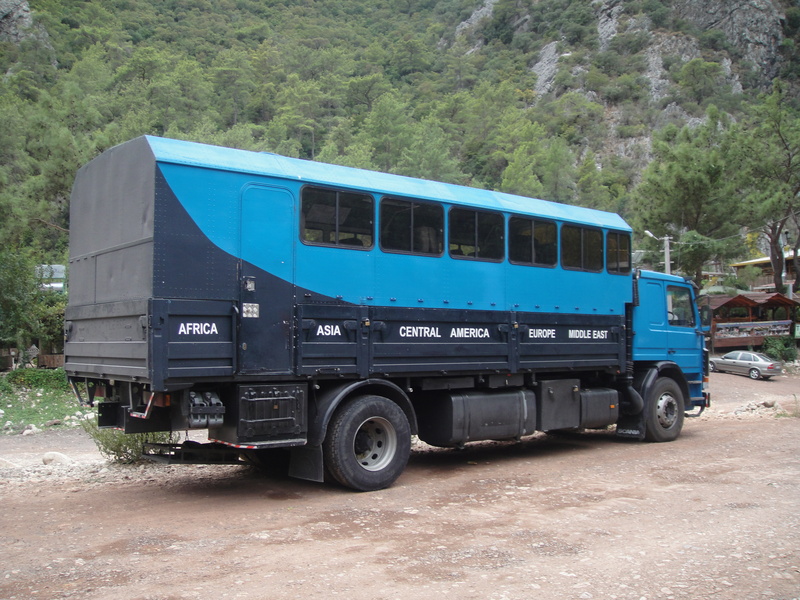 Ummm… as nice as the lorry was I don’t think I would like to spend 3 months with strangers in the confines of what is actually a container, but hey, it takes all sorts. It was a short drive to Antalya, which was our next stop for a night, before the long push to Goreme. There seemed to be no camping in Antalya but after a long 3 day search on Google we found a night club that would let you camp (or so we thought with our limited Turkish). I was convinced that it would be a waste of time but Megan, bless her, said it wasn’t, and so we spent a little while searching the backstreets until we found it. Driving in the man at the gate said ok, we could use the car park to camp, the toilets and showers to wash, and the most amazing beach bar for free! Needless to say the smugness emanating from Megan was overwhelming. Antalya turned out to be a nice little city and having spent the day relaxing and topping up the tan we wandered the pretty narrow streets that night. Ever onward and we decided to break the trip up to Goreme with an overnight stop in Konya, which is the home of the Whirling Dervishes (Google it). Finding campsites in Turkey once away from the coast is very difficult so this time we thought we would just try our luck once we got there. As it happened it all worked out rather well. 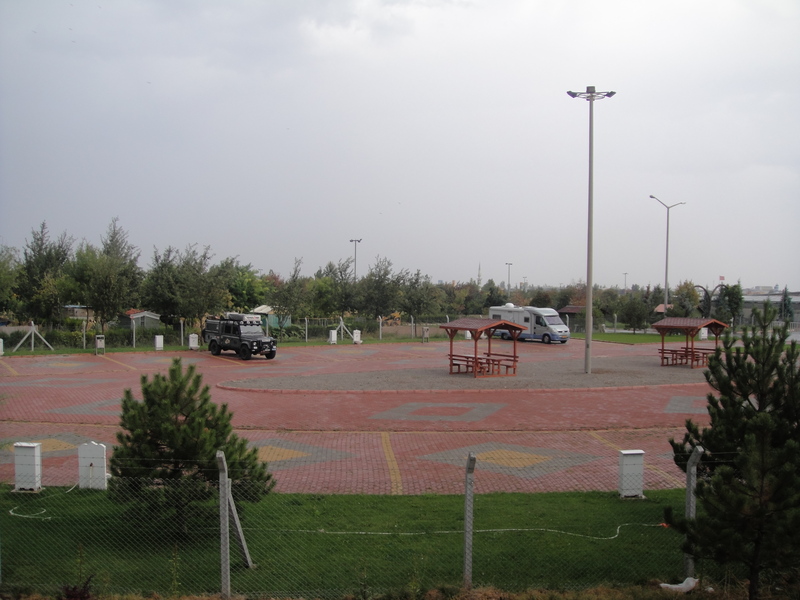 As we were driving into Konya we spotted a Dutch camper van in a car park and decided to investigate. Just a little note on the Dutch, it seems that there can be no one left in Holland, it’s mental, every camper van and caravan we have seen in the last 3 weeks has been Dutch, man they like to travel. So anyway we found our way down to the car park, met a nice security guard who informed us we could stay for free! There was even a toilet, water and power. Nice one. Konya itself was a little disappointing, maybe it was the fact that it was raining and we had to put on jeans for the first time in 6 weeks, as the weather had turned cold. 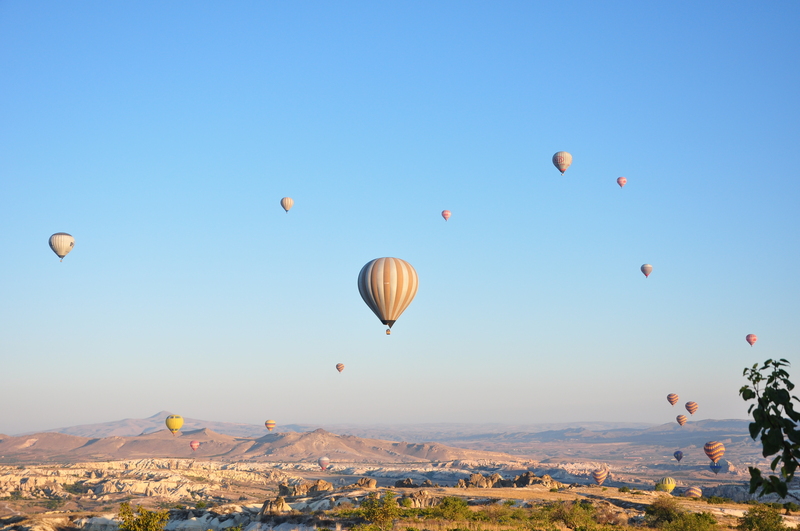 The final drive to Goreme was amazing. The landscape was stunning, it felt like we where driving across outer Mongolia and we both thought for the first time that we were true adventurers… until we were overtaken by a camper van sporting Dutch plates. Bastards. Goreme Goreme Groreme, well I can guarantee that you have never seem anything like it. 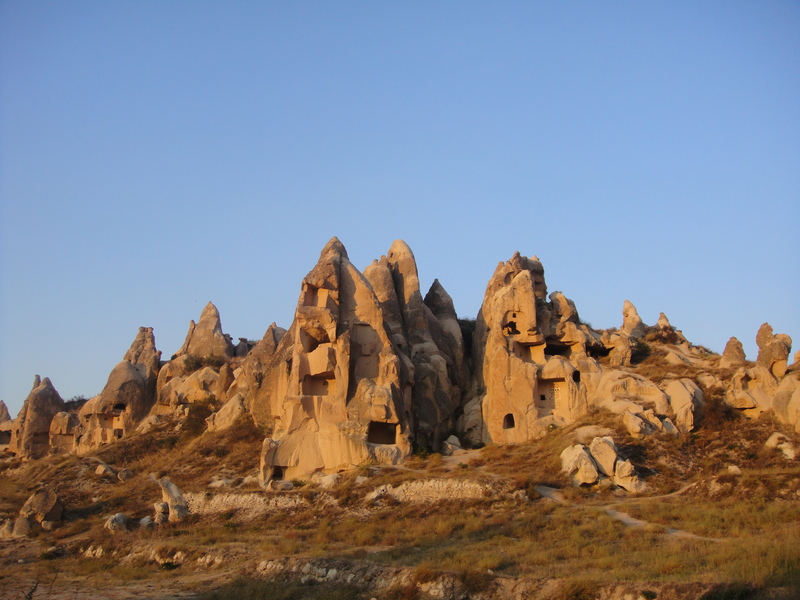 It’s quite a well known stop on the drive across Turkey, famous for the tall cave/chimneys that were hollowed out in olden times and used as churches. I’m aware that I think everything in Turkey is awesome but these really are. We stayed in a campsite mentioned in lot of other travelers’ blogs, Kaya Camping, which was a good call because we met our first ever fellow Defender 130 drivers! We have had an ongoing game since we left the UK; Land Rover Defender spotting. Don’t laugh, it’s become very competitive. I’m still ahead but Megan has clawed her way back by pulling a nice Dutch (of course) 130 out of the bag. It was owned by Joorst and Rene, who are perhaps the nicest people in the world- they cooked us dinner! The last night in Goreme was spent eating their food, sharing their traveling stories, and when a French family came over to join us it all got a little messy. The wine count reached 11 bottles by the time Megan and I crawled into bed. A great night and one of the reasons we decided to do this trip with an old Land Rover rather than take the easy flying option. To update you on our future plans; Pakistan is a no unfortunately. It’s too difficult to get a visa, too many floods and bombs. So the plan now is to catch the ferry from Bandar Abbas in southern Iran to Dubai, stay there for a while with some family friends of Megan’s, and ship the car to Mumbai. Turkey is awesome, fact. We are both blown away by the beauty of the country and the friendliness of the people. We have been here a little over a week and it’s just flown by, far far too quickly for my liking. We left Istanbul and headed back towards the Mediterranean coast. The original plan was to see Gallipoli but after looking at the map and working out just how far and how much petrol it would use we decided against it. Diesel in Turkey has to be the most expensive in the world. At the moment it is around £1.60 a litre! This makes quite a difference to the daily budget, as almost half of our budget for the whole of Turkey will be on fuel. I thought it was meant to get cheaper the further east we went…? Anyway, with Gallipoli off the cards we headed about an hour outside Istanbul and got a ferry across the sea of Marmara, which saved about an hour of driving. 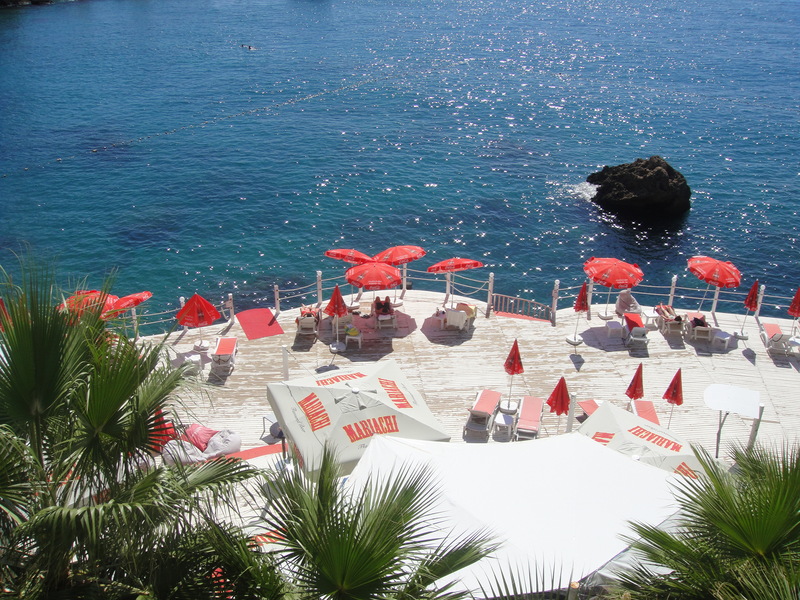 Camping in Turkey is not widespread and most, if not all the campsites are on the west coast. The GPS gave up on the map front after Greece so we are back to paper maps and all the calm and unruffled conversations that come with this form of navigation. It also means that we now only have a ball park idea as to where the campsites are. Our first campsite in Turkey took us about an hour to track down after off road driving up a farm track, off road driving reversing down a farm track, and asking local people who clearly didn’t understand a word of what we were saying. In the end Megan turned the page of the Lonely Planet and the directions to the campsite were there staring her in the face. I am still, a week later, doing all the washing up in penance for the names I called her after she admitted this fact to me. 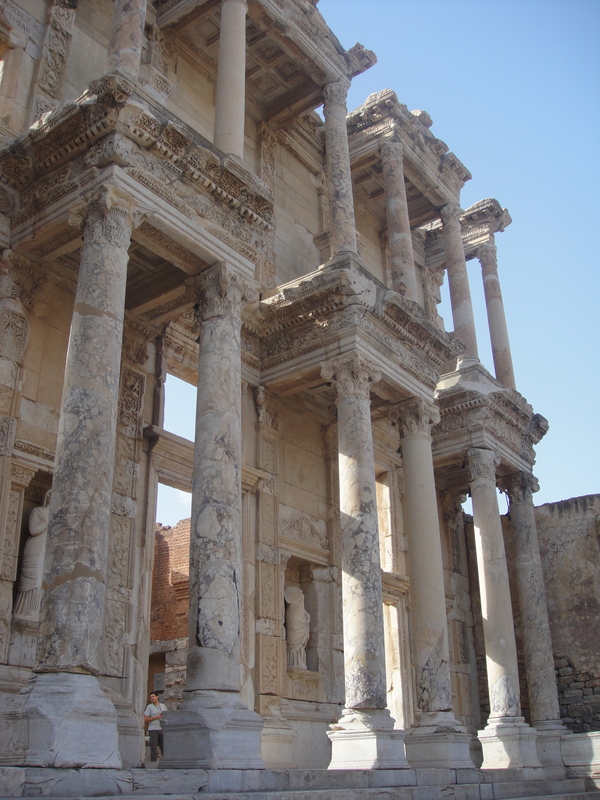 From Ayvalik we headed further south to see the famous ruins of Efes. We stayed at a very nice campsite in Selcuk but were the only ones there so it felt a little weird, which is worrying if we are ever to wild camp. The lady who ran it spoke no English but her Italian was first rate so Megan and her chatted while I just smiled and nodded in the background. Efes itself was amazing, up there with Pompeii in my mind. Following the success we had in Greece we found the mandatory Japanese tour group ever present at these places and followed them around. As far as we can understand the building below was the first ever Starbucks, built by the Inca’s 24 years ago. That night it the heavens opened and for the umpteenth time this trip it rained like someone was pressure washing the tent and car. This time however Megan’s clothes were dry! (They weren’t really but I could be bothered to get the bloody silicon out again so I told her they were, shhhhhh). From Selcuk we drove further along the coast toward the resort town of Oludeniz. Along this road we encountered our first police stop. To be honest I thought I was speeding when he waved me over but all he wanted was a look at my driving license. Again, very disappointing. I had the pack of cigarettes ready for the bribe but it was all very ordinary and straight forward, I almost wanted to go back and demand that he threaten me with prison, impounding the car and a mild beating but Megan, ever the boring one wouldn’t allow it. Booo. There are more English people in Oludeniz than Turks, all sporting lobster tans and a craving for knock off jeans. Enough said. 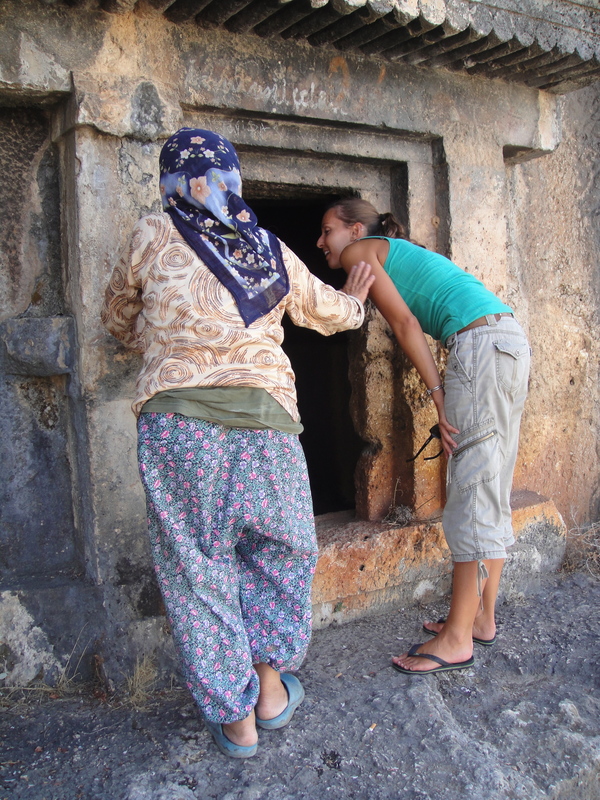 We went there for the tombs at Fethiye up the road, which again were pretty amazing. After looking around the main site we followed a hand painted sign promising more tombs that led into a little old lady’s back garden. She was very excited to see us, and not at all put off by our surprised faces she proceeded to lead us along what can only be described as a cliff edge to another set of tombs. She had the footing of a mountain goat, it was a thing to marvel as she helped us along the ledge. I’ll admit that my manhood was called into question when she held my hand to help me up a particularly tricky section. The drives to the places we have been to have been wonderful. The landscape in Turkey changes with every bend from mountain to flat plain, and everything in between, a hidden gem. Anyone who hasn’t been should come, and not just stay on the beach! Our first real border, and I don’t mind telling you I was a bit scared. There is something safe and cozy about Europe, all the shops are the same, you can get most of your favourite food (except bloody Cheerios) in the supermarkets, and even though you are in a different country one almost feels part of the same club. Turkey however is different, passports need to be shown at the border, men with rather large guns eye you up as you approach the checkpoint, and the Euro is as worthless as Monopoly money. We left early on the 20th from not so paradise camping and got to the border crossing at Ipsala around mid morning. We expected queues but there were none and once the Greeks had had a cursory glance at our passports we entered no mans land between the two countries. It is here that I’d like to tell you a tale of 10 hr waits, bribes, the Land Rover being taken apart and searched, Megan being traded for half a camel… but to be honest it was all very easy. We bought our visa from a dude in a hut, showed our insurance and vehicle registration to another dude in a hut, and the final dude stamped our passports and we were in Turkey within 25mins! How upsetting, I felt cheated of a story, but Iran is the next border and I’m sure that might be more ‘interesting’. Once in Turkey our plan was to drive to Istanbul, where we had arranged to pick up our Iranian visas from the consulate, and after a month of camping we decided to give in to our craving for a toilet that you didn’t have to share with anyone else and got ourselves a hotel. Yes, I’m sure there will be those of you out there saying we are wimps and should have held out longer and I could have, but it was Megan you see, she made me. We found what we thought was a good deal on a 4 star (I don’t stay anywhere under a 3) hotel in Istanbul for £50 a night. Bargain. It wasn’t until we booked it that we realised we the help of Google maps, that it wasn’t actually in Istanbul but over the Bosphorus in one of the many suburbs sounding the city. Doh. Anyway, they seemed to have parking and sounded nice on the phone so we thought we would give it a go. It turned out to be a very nice hotel in fact, and only a 15 min drive to a ferry which took us into the heart of the city. Megan called it luck but I like to think of it as meticulous planning on my part that paid off. Oh I nearly forgot, those of you thinking about driving into Istanbul should be aware of the toll road leading into the city. We approached the first set of booths on the motorway and as the barrier was up and the machine wouldn’t give us a ticket we thought that perhaps it was a holiday or something and we wouldn’t have to pay, so drove straight though. However, when we got to the other end of the motorway in the middle of the city with sixteen lanes of traffic coming from every direction, the barriers down and nowhere to pay, did we realise that we had made a rather large mistake. There was no way we could go through but luckily we were still far enough away from the barrier to be able to get out of the queue and stop in the middle of the sixteen lanes, hazards on of course, looking blankly at one another in hope of divine intervention. It came in the shape of a very nice Turkish chap wandering across the lanes who explained that I needed to buy a card from the office on the other side of eight lanes of traffic in order to get through the barrier. Turkey it seems no longer take cash on their toll roads, damn you out of date Lonely Planet. I made an attempt to get out of the car but the man told me that I had to drive, ‘it would be safer’ he said. So a five point turn, driving the wrong way up a motorway, crossing eight lanes of on coming traffic, some more sailor swearing from the co-chair and a set of new underwear later we managed to purchase a card from the office and made our way to the hotel. If only we had taken a picture. After the emotional trauma of Turkish tolls one of the coolest things so far on this trip has to be crossing the bridge over the Bosphorus and seeing the sign ‘Welcome to Asia’, awesome. The next few days were spent wandering around the city and getting our visas. The Iranian visa was actually quite straightforward. We had applied for them back in the UK so only had to pick them up in Istanbul, which saved a lot of time. Megan donned her headscarf for the first time, I tried not to laugh, failed, and after a little wait we paid the €95 each (ouch!) and were told to come back the next day to pick them up. We returned the next day and were finger printed (which by the way is a bugger to get off your hands), and issued with our visa. Again, all very easy and everyone was very pleasant, let’s hope its all this effortless. Istanbul is an immensely interesting city and nothing I write here will do it credit, so you should all come and visit. Saying that though we both really enjoyed the markets around the Grand Bazaar and spent a whole day getting lost in the side streets and alleys. 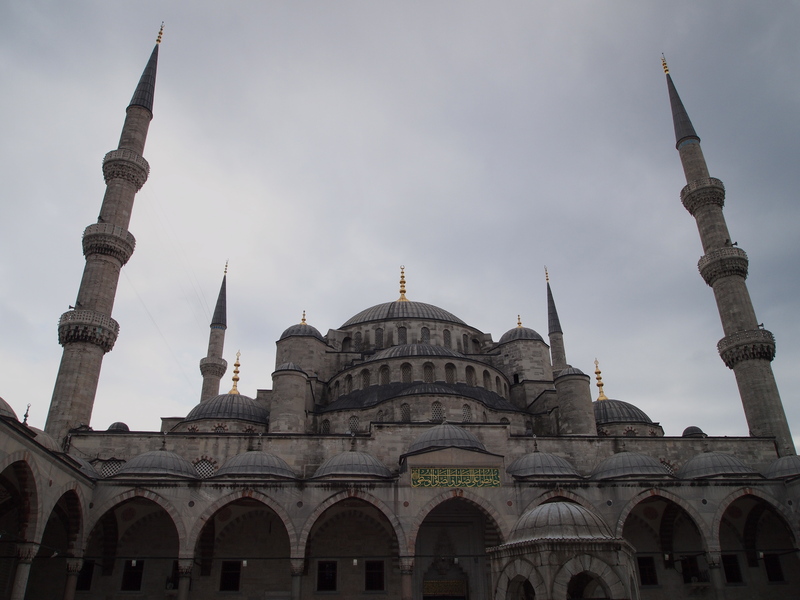 The Blue Mosque is a must, as is a ferry trip so you can get a feel for the size of the place and get to see all the great historic landmarks from the sea. Crossing the bridge to Beyoglu is also well worth it to see the marked difference between the more traditional, conservative side of Istanbul and the contemporary culture that’s more in line with Europe. I love the font they use in their road signs. Megan loves the man in the Mosque outside our hotel who sang at 5 in the morning every day. We both love the Kebabs.